Very bad and brief synopsis: The story revolves around a family of six that begins to crumble in their suburban 1970s existence. The father, desperate to regain some semblance of control, packs everyone up and moves them to Africa. Much chaos ensues. Seriously. Read a synopsis elsewhere...like here or here. As for my overall opinion: hmmm...this is difficult. I really loved it until the last 1/4, because I felt as if the author was suddenly playing the drama card/gotcha card to amp things up. In other words, she took a perfectly meaningful story (beautifully written, as well) and then, at the end, popped in WAY too many surprise moments (which, honestly, weren't that much of a surprise, but they reeked of trying to surprise you...and I found this annoying). Still: I really liked the book and I would recommend it. 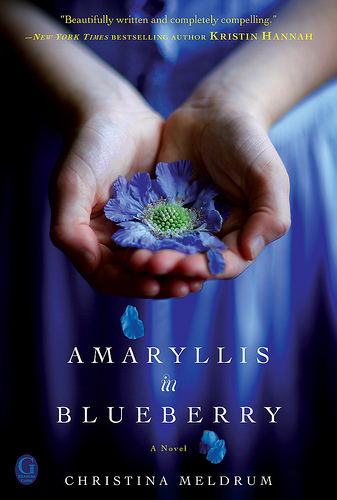 Amaryllis in Blueberry is an ambitious novel, and it’s difficult to say how well it succeeds. On one hand, it’s a book that kept my attention and kept me reading. But when I was finished, I felt uneasy. The picture of the book in my head was very vague and I felt as though there were some dropped plotlines and the story wasn’t as fleshed out as it could have been. That being said, it kept me reading from beginning to end and went very quickly, as I was swept up in the story. After reading this one, I too felt "uneasy." But, another odd thing happened with my experience of this book. If I picked up the book, I fell into it (the writing is very well done), but if I left it alone for a while, I felt completely detached from it. Now, S. Krishna attributes this to secondary stories that seem incomplete. I guess that could be one issue. But, for me, there was just a fundamental disconnect. It doesn't bother me if things are left unsaid or if I don't get the entire story. But I found it unsettling that the world of the novel didn't accompany me into my post-reading thoughts. I mean, usually, if I really like a book (and, I DO really like this one), I think about it a lot, imagining the characters in my head, perhaps in new situations or reliving the ones the author has discussed in the novel. But with this one? No. Nothing. ...AND YET: I think that this may actually be a strength of the book. Feeling the disconnect, I mean. Because that is the point, in my opinion, behind the story. This entire family is disconnected--from reality, the world, one another--everything. So, if the author's goal was to accomplish the same feeling in the audience, then well done Meldrum.